That’s right a new Doorknob Society novella is heading your way. I’ve been working on this one for awhile and just finished the last round of edits on it before I ship it back to my editor for the final once over. 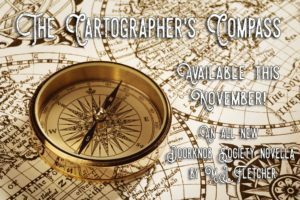 The Cartographer’s Compass is a tale I’ve been wanting to tell for some time now. I laid clues about the Cartographer throughout the other books and novellas. He has always been in the background, a bit of Old Kind history that has lingered. I thought now would be the perfect time to explore the story a bit more. I’ve also been taking a gander at the cover for the novella and hope to have that to show you all in the next week or so. When you’ll also be getting the story description for The Cartographer’s Compass. I’m thrilled to have a new Doorknob Society story to share with you all. This isn’t the only news either, I should have even more good news regarding the final Grimm Chronicles book coming shortly. If you want to get yourself excited for the newest book I recommend checking out one of the other novella’s I’ve written about DS; The Victorian Express, A Candlestick Christmas. Enjoy and let me know what you think the next novella should be about in the comments below.